Railpictures.ca - Geoff Elliott Photo: CP’s Holiday train is running a little behind as it approaches the Rochester Town Line, just east of St. Joachim, Ontario on December 1, 2018. The sun had just ducked behind the clouds so that you can see the lights on the train. Looked good, and my kids loved seeing it again this year. | Railpictures.ca – Canadian Railway Photography – photographie ferroviaire Canadienne. 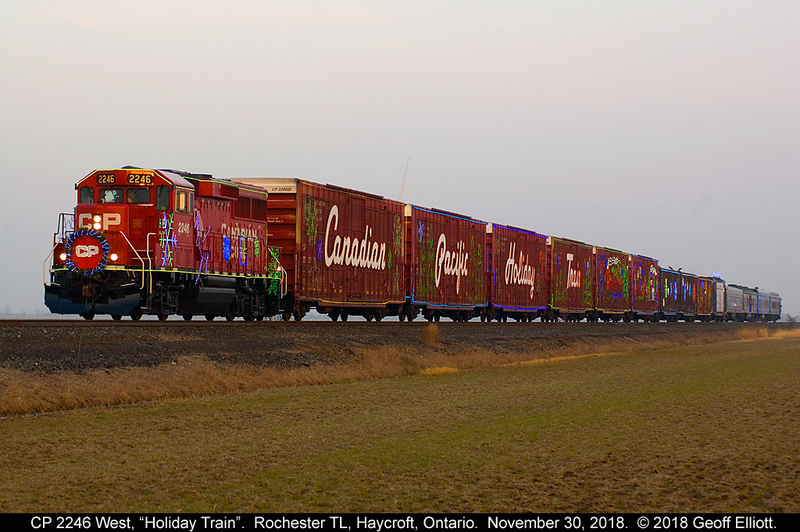 Caption: CP's Holiday train is running a little behind as it approaches the Rochester Town Line, just east of St. Joachim, Ontario on December 1, 2018. The sun had just ducked behind the clouds so that you can see the lights on the train. Looked good, and my kids loved seeing it again this year.